(09-21-2017, 07:32 PM)LonelyPony Wrote: Can I join? Sure, contact me by PM or Facebook if you have read all the details on the main post. Common adjutants: Latest patch members I manage to grab lol. 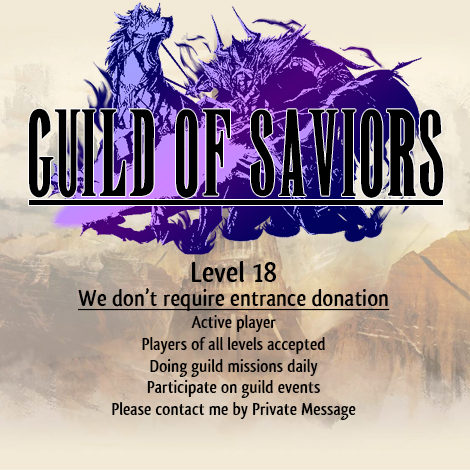 I'm Guild of Saviors president, if you want to join be sure to join the Discord server for information. Hi everyone since September of 2016 I'm now Guild of Saviors new president. We used to be a top #100 free to play usually staying on #2 of English rank, but due to decisions of previous guild leader we moved to stress free with some minimum requirements. Most of our guild members are from SEA region but we are trying to include members from every part of the world. Different adjutants assigned to each member, that way you will have access to all the important leader cards all the time. Also since patch 13.4 I'll be able to rent specific adjutants for everyone in the guild and purchase specific stages for everyone to challenge. Facebook as main platform of communication, we have a private group and 2 Messenger channels. The following in game bonuses: 30% extra coins, 30 extra EXP., 12% Lv. Up bonus. Lv. 350+ members ready to help you build teams and get advice to pass all the Extra, Elite, Ultimate, and Nightmare stages. We have 115 member slots. 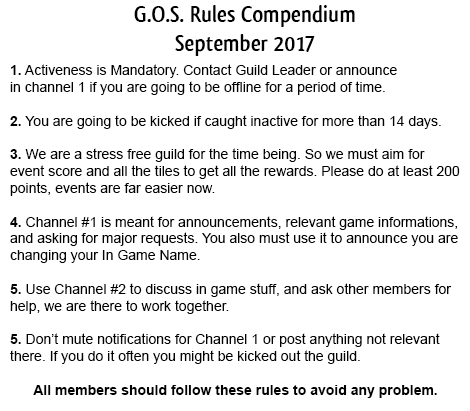 I usually don't check for inactive players but if you are away for more than 2 weeks without prior notice you will get kicked out of the guild. For traditional guild events we don't have a minimum score or demand participation but you can't skip more than 3 events on same year. We recommend to contribute at least 200 points. We have got all the rewards on all the events. Must have a Facebook account to join our chat channels. Please contact me here over PM or Facebook if you are interested. How often do you guys do the purchase stages of PR materials? I am an active player and scored 3000 points in the recent Guilt event. (02-21-2018, 12:34 PM)Poop Wrote: How often do you guys do the purchase stages of PR materials? I am an active player and scored 3000 points in the recent Guilt event. The first day of every patch since those are available once, then it will depend on you to get the keys for black on the rest of the month. Nice, we don't mind scores at all as long as you are active and provide an adjutant as specified. Hi there, is your guild still recruiting? I would like to join.